If you have dentures, crowns, caps or braces it can prevent you from wearing a mandibular adjustment device (MAD). And for some people, it’s just never going to be relaxing to sleep properly with a full MAD inside their mouth. For that reason, I wanted to write this comparison of two devices that are also effective without feeling so overwhelming inside your mouth. 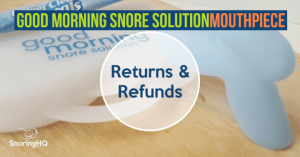 They belong to a category of anti-snoring mouthpieces that we call tongue stabilization devices (TSDs). 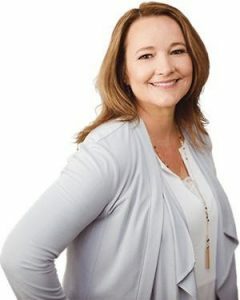 Essentially, a tongue stabilization device rests right around your lips, and is designed to keep your tongue extended toward the front of your mouth. This is important because, as we drift into sleep, a tongue that rests back into the throat area can block airflow for mouth breathers. 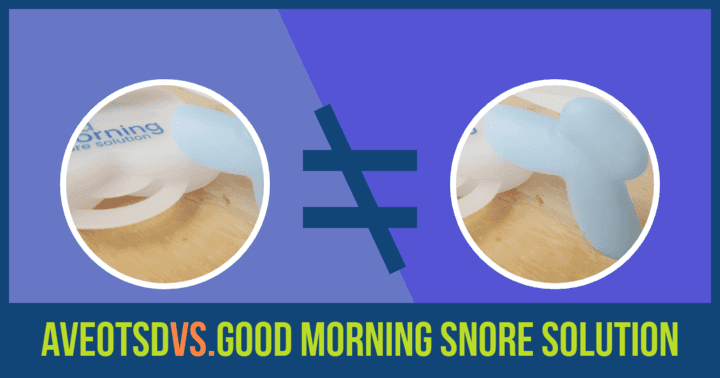 To the right is an image of the Good Morning Snore Solution device, which should give you a visual idea of how it anchor between the lips and front teeth, as well as where the tongue goes. 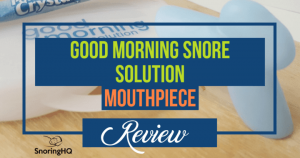 Before we start on the comparison, let me link you to the full reviews that we’ve done on AVEOtsd and Good Morning Snore Solution (our pick for best TSD). If you like what you read here, you can jump over there for a deeper level of detail. Material – Both devices are made from a medical grade silicone that is really gentle on the gums and lips. GMSS is BPA-free, also. One can only assume AVEOtsd is, as well, but it is not stated on the official website, if it is, or not. Sizing – AVEOtsd is available in three sizes, but medium is worn by 90 percent of users. Also, AVEOtsd needs to be fitted by a professional and modifications can be made to accommodate a larger frenulum. GMSS is a one-size-fits-all device that comes ready to use right out-of-the-box. No professional fitting process is needed. Lifespan – Both devices have an average lifespan of 12 months, but there are reports of them lasting twice as long. Guarantee – AVEOtsd comes with a 6-month warranty on manufacturing defects. GMSS does not have a warranty, but you do get a 30-day return policy, so you have plenty of time to decide if it is for you. Care – The simplistic design of both TSDs make them a breeze to clean. A denture cleaning solution is ideal. You can also make a solution of toothpaste and water. Mouthwash should never be used on either device. 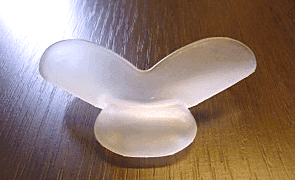 Comfort – GMSS and AVEOtsd attach to your tongue and sit between your inner lips and outer gums. They are comfortable, but they both have the potential to leave your tongue quite sore, if attached too tight. I put them both to the test and found GMSS to be just a little easier to attach. Price – These TSDs are priced quite similar. GMSS has a regular MSRP of $99.94, but if you order two the price works out to about $64.97 per device. You will pay between $90 and $140 for AVEOtsd. You may have the expense associated with doctor dentist appointments and follow up visits, as well. Availability – The biggest difference between AVEOtsd and GMSS is that you can order GMSS online through a secure website. You will need to see your doctor or dentist to have an AVEOtsd prescribed to you.